Health care costs too much. Having to pay more for doctors, hospitals and pills is threatening national security, undermining our industrial competitiveness, leading to underinvestment in vital infrastructure and exacerbating economic inequality. As we devote more and more of our individual household budgets, business revenues and national treasure to healthcare, it these excess costs will "crowd-out" our ability to pay for other worthy stuff. Naturally, insightful Population Health Blog readers know the real story is more complicated than that. Inflation-adjusted costs of other "stuff" that comprise much of the U.S. economy have dropped. 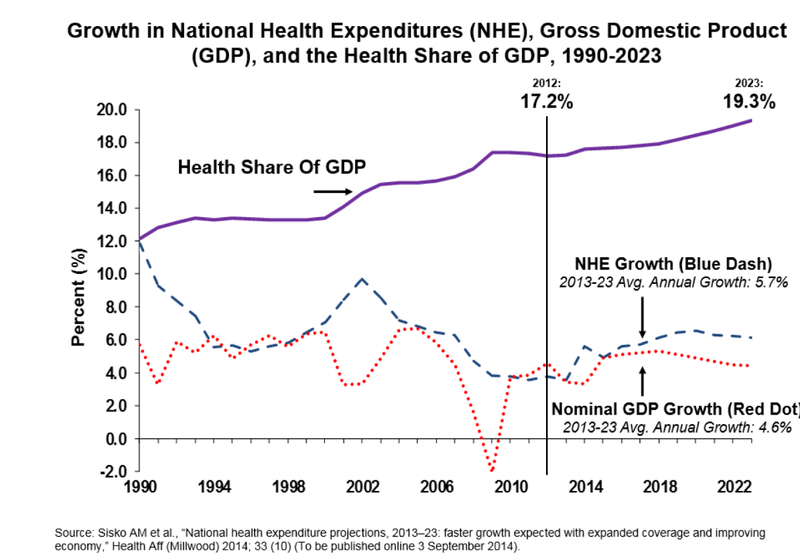 As the denominator has gotten smaller, the health care numerator appears relatively bigger. More on that here. What's more, as society has benefitted from lower energy, housing, transportation and food costs, consumers are better able to choose to shift resources toward the health care that they want, which further fuels its growth. Plus, there's the observation that government subsidies have a significant impact. Our elected officials are advancing their constituents' wishes, right? the PHB suspects that the percent of GDP going toward the medical-industrial complex is destined to hit 50%. The provocative PHB asks if that's such a bad thing. If 50% of all persons disabled or retired, the other 50% of us can look forward to the happy prospect of being gainfully employed thanks to taking care of them. 1. 50% of all parking space acreage (for our Google Cars, naturally) will be devoted to the disabled. The rest of us will benefit from longer walks, with a 50% greater likelihood of achieving our 10,000 per day step quota. 2. 50% of primary care providers won't be physicians. But 100% of all those non-physicians will have slept in a Holiday Inn last night! 3. For those primary care physicians who remain in practice, 50% of their income will be thanks to the burgeoning science of tattoo removal, botox and dermal fillers. 4. 50% of all wheelchairs and bedside commodes will be of the "jumbo" variety. 5. 50% of all medicines will have dire "black box" warnings. Likelihood that patients will actually take them will be decreased by 50%. 6. Automated decision support will thwart the ability of lawyers to sue doctors. Following a path of least resistance, the legal community will respond with a 50% increase in lawsuits in other growth areas of the economy, such as robotic cars and pillow manufacturing. 7. Despite automated decision support, 50% of all providers will still detest their electronic record system. The other 50% will loathe it. 8. 50% of all mental health counseling will be automated. Not kidding! 9. When health systems finally grasp the impact of handhelds and apps, there will be a 50% increase in desk-top PC recycling. Chances that DC's "meaningful use" criteria will recognize this soon enough are 50-50. 10. Growing traffic on the PHB's blog will lead to a 50% increase in its vast web-site related income. There is a 100% chance, however, that the PHB Spouse will not be suitably impressed.